Economists, officials, and executives across the globe increasingly support carbon pricing to stem the rise of greenhouse-gas emissions. Can it work? Economists, officials, and executives across the globe are increasingly united around using carbon pricing to stem the rise of greenhouse-gas emissions. Can it work? The message itself was not so extraordinary. For years, economists and environmentalists have made the case for using price signals to efficiently and effectively tilt global energy toward cleaner sources. But this letter didn’t come from a think tank or an environmental group. Instead, the signatories of the June 1, 2015 dispatch were chief executives of some of the world’s most carbon-intensive companies – oil supermajors like BP, Eni, and Statoil – companies that profit enormously from the very fuels carbon pricing aims to curtail. Some dismissed Big Oil’s call for a popular climate policy as a public-relations ploy. Others noted that only European firms signed on, representing just one slice of a sprawling international oil and gas industry. But if taken in earnest, the letter from six oil supermajors reflects a widening acceptance of climate change as a challenge humanity should – and can – tackle. Even more significantly, the letter offers up a solution embraced by an increasingly diverse group of businesses, governments, non-profits, investors, and other institutions. In Brussels and in Beijing, at top universities, in board rooms of the world’s largest companies, in city and state capitals throughout the US and beyond, and across the liberal-conservative spectrum, momentum is building behind the wonky financial tools that make carbon emissions more expensive. Taxes and markets have been used to solve global environmental problems of the past. Now there’s hope they can address today’s climate challenge. It’s a viewpoint espoused by nonprofits like the Sierra Club. But it also gets the backing of energy multinationals like Royal Dutch Shell. The idea is simple. We consider carbon-heavy fuels like coal cheap because we usually don’t factor environmental costs into the final market price. Inflating that price – either through a tax on carbon emissions or carbon credits that emitters can buy and sell – sends a clear and strong signal in the universal language of money. Markets adapt to the added cost burden, discouraging emissions-heavy fuels and encouraging lower-carbon ones like natural gas, or zero-carbon sources like nuclear power and renewable energy. Unlike clean-energy quotas or other top-down policies, carbon pricing offers a certain level of predictability, flexibility and efficiency that makes it attractive to a wide range of diverse constituencies. Carbon taxes and emissions trading tell producers to reduce carbon emissions, but it allows each producer to determine for itself how to do so. Putting the idea into practice, however, is another story. Exactly how much should carbon cost? Set the price too high and there’s a risk of public backlash against more expensive gasoline and other everyday goods. Set it too low and emitters have little incentive to change their behavior. Europe experienced the latter when it rolled out an emissions trading system in 2005. US efforts to implement a similar cap-and-trade system stalled in the Senate. 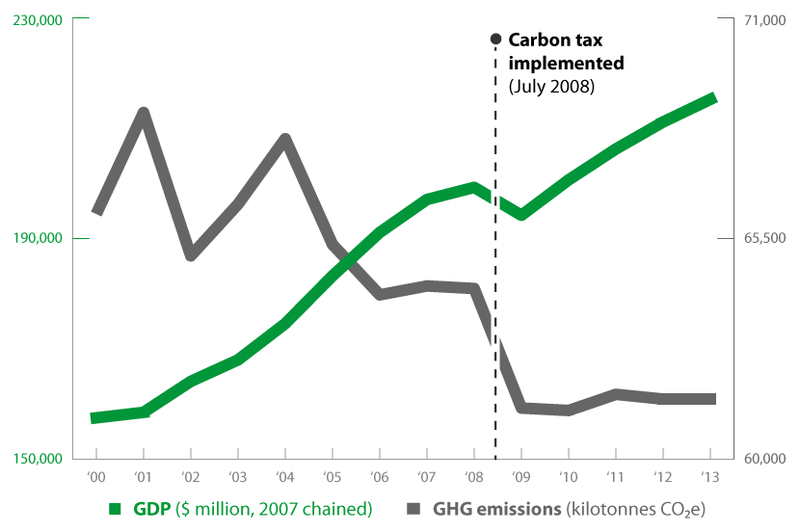 Australia implemented a carbon tax in 2012, only to repeal it three years later amid shifting politics. Setbacks aside, faith in carbon pricing as a climate-change solution is growing. Last month, China announced it would implement a nationwide emissions trading system (or cap and trade) by 2017. As the world’s most populous country and the world’s largest emitter, it would make for the world’s largest and most significant carbon market. Sign up for Recharge, the Monitor's weekly digest of global energy news. On a sub-national level, cities and states in the US and abroad are implementing their own taxes and trading systems to reduce emissions. The Obama Administration’s Clean Power Plan, finalized in August, promotes cap-and-trade as one method states can use to meet new emissions-reductions targets. In the private sector, major energy firms already factor in a theoretical carbon price in internal accounting. Other companies – take Microsoft for example – voluntarily tax themselves for carbon use as a way to lower their climate impact and improve internal efficiencies. Currently, about 40 national and over 20 sub-national jurisdictions have implemented or scheduled carbon-pricing systems, according to a report by the World Bank and Ecofys, a renewable-energy consultancy. That represents nearly a doubling of such systems since 2012. All together, global carbon taxes and trading systems are estimated to value just under $50 billion, according to the World Bank and Ecofys. With just a couple months before major international climate talks in Paris, analysts believe market-based solutions will factor into how more countries, states, and cities across the globe reach future emissions-reductions goals. After all, these financial instruments helped phase out dangerous pollutants in the 1970s, 1980s, and 1990s. There’s hope they can do the same for today’s planet-warming gases, but the spread of these solutions have not kept pace with the scale of the problem. The number of countries, regions, and cities using emissions trading or a carbon tax across the globe has nearly doubled since January 2012 to cover about 12 percent of the world's greenhouse-gas emissions, according to the World Bank. If not, it’s because scientists, economists, and policymakers largely solved what, in the 1980s, looked like a mounting environmental problem. Chemicals used in refrigeration, aerosols, and other everyday items were thinning out the planet’s stratospheric ozone layer, which blocks out dangerous ultraviolet radiation. Nations came together in response under the Montreal Protocol, deemed the “single most successful international agreement” by no less an expert than former UN General Secretary Kofi Annan. Adopted in 1987, the protocol capped the use of chlorofluorocarbons (CFCs), halons, carbon tetrachloride, and other compounds responsible for chewing away at the ozone layer, and enabled countries to trade permits to pollute. Some countries, including the US, created their own domestic cap-and-trade systems, which helped to gradually end the use of ozone-depleting substances in the developed world. By 1998, the ozone layer stopped thinning over most of the world, and scientists believe that the layer should return to pre-1980 levels sometime between 2060 and 2075. Experts often point to the Montreal Protocol as a case study for how cap-and-trade systems can address environmental problems that transcend national borders. They’ve been used successfully elsewhere – to eliminate lead from gasoline and to slash the sulfur-dioxide emissions responsible for acid rain. Transposing past cap-and-trade success stories onto global climate change has proven difficult. Ozone depletion, leaded gasoline, and acid rain, and were perceived as much more immediate public threats than global warming, which many still view as a distant threat. Alternatives to lead-based gasoline and ozone-depleting substances were fairly readily available when countries came together to phase them out, and the technology needed to reduce sulfur dioxide emissions was relatively cheap. Meanwhile, alternatives to the carbon-based fuels responsible for the bulk of global greenhouse-gas emissions, are harder to come by. Solar, wind, and other carbon-free energy sources are rapidly becoming viable alternatives, but swapping out one energy system for another is a much taller order than swapping out one kind of refrigerant or gasoline for another. What’s more, the technology needed to capture carbon dioxide emissions from coal plants remains economically viable only in certain instances. These obstacles haven’t stopped major emitters from trying to use cap and trade to curb planet-warming emissions. In 2005, the European Union, the world’s third largest emitter, launched what remains the world’s largest cap-and-trade scheme. Then, the global economy collapsed. Demand for polluting energy fell and thus so too did prices for carbon credits. Prices hovered around $7 per metric ton in the EU’s Emissions Trading System (EU ETS) at the time, whereas the International Energy Agency estimated they would need to cost around $65 per ton to nudge utilities away from coal-fired plants. As a result, companies had little incentive to cut down on emissions. By 2013 the system was facing a crisis. When the EU attempted to reduce the number of permits by delaying the scheduled release of new ones, the initiative failed in the European Parliament. Low carbon credit prices don’t necessarily mean the system isn’t working, as environmental economist Robert Stavins and others have noted. Indeed, it may just be evidence of unrelated factors like slow economic demand or other energy policies working in concert with cap-and-trade to reduce emissions. The primary concern with the EU’s system was over its inflexibility. When market conditions changed dramatically, efforts to adapt to new realities fell short or failed completely. While the EU ETS has outgrown early growing pains, the EU still struggles to balance the system. Last month, the European environment ministers agreed to a proposal to create a reserve of CO2 permits in January 2019, hoping to remove surpluses from the market. Efforts to implement a similar system in the world’s No. 2 emitter never made it out of the US Senate. Early in his first term, President Obama made passing cap-and-trade a priority, but the Waxman-Markey legislation was abandoned in 2010, largely under the pressure of a limping economy and opposition from Republicans and energy-state Democrats. But where cap and trade failed nationally in the US, it has found more success at the state and regional level. In 2009, ten states in the Northeastern US implemented a Regional Greenhouse Gas Initiative (RGGI) that capped carbon-dioxide emissions from electric power plants. In its first four years, the program (which now covers nine states) raised over $1 billion in proceeds from the auction of carbon credits, according to RGGI. Much of that money was reinvested in regional clean-energy and efficiency programs. RGGI estimates that over their lifetime, those programs will save 11.5 million megawatt-hours of electricity and avoid the release of approximately 10 million short tons of carbon emissions. That’s the equivalent of taking 1.9 million cars off the road. Meanwhile, participating households and businesses are expected to save more than $2.9 billion in lifetime energy bills. It’s an ideal outcome for a carbon pricing scheme: avoided emissions, more efficient energy, reinvestment in the region, and reduced energy bills. Of course, RGGI alone isn’t cleaning up Northeastern US energy. The Great Recession of 2008 and a boom of cleaner-burning natural gas have also contributed significantly to decreased energy use and a shift toward lower-carbon. But RGGI’s quiet success has inspired other US states like California and Oregon to implement, or at least consider, a cap-and-trade scheme of their own. The Obama Administration’s Clean Power Plan, which aims to reduce carbon dioxide emissions from power plants by 32 percent from 2005 levels by 2030, may encourage other states to follow in RGGI and California’s footsteps. Now, cap and trade faces its toughest challenge yet. China, the world’s largest carbon emitter and second-largest economy, announced last month it would implement its own emissions trading system by 2017, motivated by its smoggy skylines and a desire to be a clean-energy leader. It’s a daunting task. China faces regional corruption, pushback from state-owned energy companies, and the fundamental issue of transparent data collection. It turns out determining just how much energy China consumes – and how much carbon dioxide it emits – is easier said than done. Those pilot programs – introduced in seven Chinese cities and regions in 2013 – have established a basic framework to build upon when designing the national program. They have shown some signs of success, but a report last month by the World Resources Institute found that “funding gaps, accounting loopholes, inadequate enforcement and compliance, and market illiquidity” remain persistent problems. Scale remains perhaps the greatest challenge. It’s one thing to design a transparent, efficient market for a city of 11.51 million. It’s another task entirely to design one for a country of 1.4 billion. When British Columbia set out to slash its own greenhouse-gas emissions, the Canadian province decided against using cap and trade. Instead, it opted for a tax. Launched in 2008, British Columbia’s carbon tax is lauded for its revenue-neutral design. A reduction in income taxes offsets a new levy on the carbon content of fuels. The result? Per-person consumption of fuels dropped by 16 percent from 2008 to 2013 while economic growth kept pace with the rest of Canada, according to Sustainable Prosperity, an Ottawa-based think tank. Income and corporate taxes, meanwhile, were slashed, and the program earned the praise of international financial institutions such as the World Bank and the Organization for Economic Cooperation and Development. By 2012, the province’s emissions including carbon offsets had dropped 6 percent below 2007 levels, meeting an interim goal on the path to cutting emissions 80 percent by mid-century. There’s a reason many economists prefer the kind of carbon tax British Columbia adopted. Cap-and-trade systems tend to be complicated, bureaucratic, and vulnerable to exploitation. A tax is simple and elegant. When combined with a tax reduction elsewhere, the impact on the economy is a net neutral, or even positive. Between 2008 and 2013, British Columbia's greenhouse-gas emissions fell 4 percent while GDP grew 8 percent. The Great Recession contributed to the trend, but emissions remained in check even as the economy rebounded and expanded. Last month, the IMF’s Ms. Lagarde joined a growing chorus of support for a global carbon tax over other methods to cut back on emissions. “[W]e’ve looked at the benefits of both systems and pretty much unanimously come to the conclusion that a carbon tax is more efficient, much easier to administer, and will not leave way for a lot of unnecessary friction or leakages in the system,” Lagarde said last month at an event hosted by the French embassy in Washington. The drawback of a carbon tax is that it is regressive. Poorer households spend a larger share of their income on basic necessities like heating and transportation fuels than higher-income households. A $15 per metric ton carbon tax would cost households in the lowest income bracket more than twice as much as households in the top 10 percentile, according to a 2014 study at Stanford University. Still, supporters argue that carbon-taxing schemes can be designed to offset the negative impact they could have on low-income populations. Even in developing countries that face difficult financial hurdles to increasing taxes, advocates say increased revenue from a carbon tax can be used to alleviate other tax burdens. With some simple financial reshuffling, a carbon tax can be completely revenue neutral and can even spur growth. Politics present another obstacle in the way of implementing a successful carbon tax. Any policy with the word “tax” in it has a way of scaring off voters and their elected representatives in government. Consider Australia. After years of contentious debate, the Australian government, under Labor Prime Minister Julia Gillard, implemented a carbon tax in 2012. Three years later, it was gone. Pro-business Prime Minister Tony Abbott helped push for the tax’s repeal after being elected on a promise to “ax the tax.” All told, between 2007 and 2014, the national debate around carbon taxing contributed to the political demise of three Australian Prime Ministers who supported the tax. If there were ever a moment for countries to harness the momentum behind carbon pricing, it would be in Paris this December. Delegates from 195 countries will convene in the City of Light to finalize a global climate agreement that is years in the making. Virtually everyone involved agrees greenhouse-gas emissions must be dramatically slashed, but debate persists over how exactly to do it. The current strategy relies on a patchwork of voluntary commitments from individual countries, with little in the way of binding, shared actions. For some, carbon pricing would add a much-needed centralized component to a largely decentralized agreement. And yet, carbon pricing has been largely absent from draft agreements. Negotiators involved in the talks widely agree that countries would be reluctant to sign an agreement that includes a requirement to tax carbon. Countries are concerned about their sovereignty and the impact such a scheme could have on their national economies. What’s more, the economics of determining a single price for a commonly used good on a planet of 7 billion are staggering. But even though the Paris agreement itself will not result in a global carbon price, experts believe a strong commitment to reduce emissions in Paris would accelerate the proliferation of such schemes around the globe. As individual countries seek ways to make good on their ambitious climate pledges, they may turn to the market-based systems that show promise in British Columbia, the northeastern US states, China, and elsewhere.